Shaindel Beers was raised in Argos, Indiana, a town of 2,000 people. 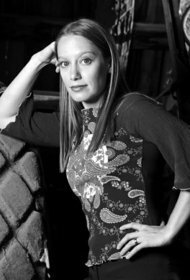 She studied literature at Huntingdon College in Montgomery, Alabama (BA), and at the University of Chicago (MA) before earning her MFA in Creative Writing (Poetry) at Vermont College of Fine Arts. She has taught at colleges and universities in Illinois and Florida but feels settled in the Eastern Oregon high desert town of Pendleton. Her awards include: First place Karen Fredericks and Frances Willitts Poetry Prize (2008), Grand Prize Co-winner Trellis Magazine sestina contest (2008), First place Dylan Days Poetry Competition (2007), Award-winning poem published, Eleventh Muse (2006), Honorable mention, Dorothy Sargent Rosenberg Poetry Awards (2005), Honorable mention, Juniper Creek/Unnamed Writers Award (2005), and the title poem from this collection, “A Brief History of Time,” was nominated for a Pushcart prize (2004). She is the Poetry Editor of Contrary (www.contrarymagazine.com). We are more than honored to have you with us. As they say in eastern OR; "howdy". May I recommend Sam's A Certainty and Not the Poem I Meant to Write? Hi Shaindel--I look forward to reading your writing here. Welcome, Shaindel. Great review of Lorrie Moore's novel at Contrary. She's one of my favorite writers. And, indeed, she is one of the funniest writers out there, if not the funniest. Your review of the true-crime book was HARROWING and so well-done. I'm naturally pessimistic about people, especially now that I have young children, and am even more so after reading such a harrowing, brave review. Hello, Shaindel - Glad you're here. Welcome. You must log in to write on Shaindel Beers's wall.